IT WAS the most well-attended Aldersgate Convention to date. It also saw much more participation from the participants in terms of interaction and questions asked. And many of the questions were “profound”, in the words of the speaker himself. The Rev Dr David Wilkinson, who addressed participants at the two seminars on May 19 and the three evening public talks on May 21, 22 and 23, was peppered with questions from the word go. Question after question was shot at him as soon as his presentations were over, and he did not have enough time to answer all of them. Some had to be answered at the following day’s session. 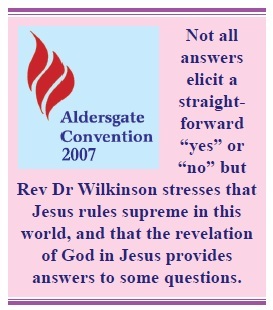 In his answers – some of which he said he did not know as not all answers elicit a straight-forward “yes” or “no” – he emphasised that Jesus rules supreme in this world, His world, and that the revelation of God in Jesus provides answers to some of those questions. About 500 people attended the seminar for adults at Faith Methodist Church and close to 450 came for the youth seminar. The Rev Dr Wilkinson, Methodist theologian-pastor and astrophysicist from the University of Durham, was the keynote speaker at this year’s Aldersgate Convention from May 19 to 24. 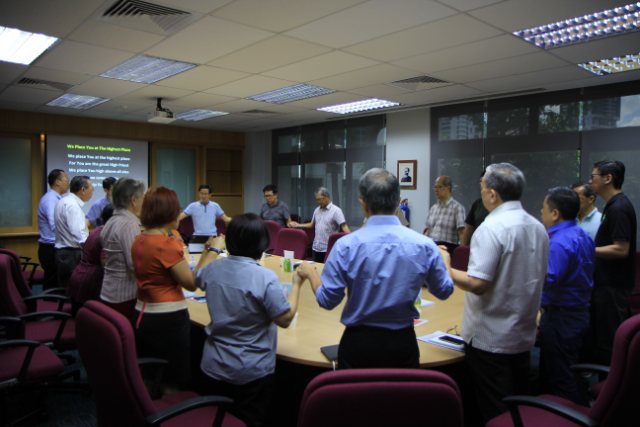 He addressed the theme “The Heavens Declare His Glory: Science and Christian Faith” through the seminars, the three evening talks and the Aldersgate Service, which rounded off the annual celebration for Singapore Methodists to affirm their unity in Christ as they gathered to explore their Wesleyan heritage. And because this year was the 300th anniversary of the birth of Charles Wesley, the Methodist School of Music presented a resounding Aldersgate Hymn Festival at Victoria Concert Hall on the evening of May 20 (see story on Pages 10 & 11). It featured a world premiere of 10 new musical settings for Wesley’s hymns by seven Asian musicians, including two of our best-known musician-composers, Dr Lim Swee Hong from Trinity Theological College and Mr Jusuf Kam from Wesley Methodist Church. All tickets for the festival were sold and the hall was packed to capacity. As in the past year, some fellow Methodists from Indonesia, Malaysia, the Philippines and India came for the convention. Also present at the May 19 seminar was the Rev Ralph Steele, a United Methodist Church minister from Texas, who was passing through Singapore with his wife and son. “When I saw your flyer and read about the Aldersgate Convention, I immediately decided to come with my wife,” he told Methodist Message. Mr Khoo Ui Cheang from Wesley Methodist Church, Ipoh, said he was very pleased that he could attend the convention this year not only because he had gained “something useful” but also because he had the opportunity of meeting other Methodists. “It is wonderful to see the Aldersgate Convention bringing together members of the Methodist community from various countries to learn more about our faith and heritage, and to fellowship with one another,” added Mr Khoo, who missed last year’s convention but had been here two years ago. Ms Sharon Frances C. Nabor, from the Evangelical Methodist Church in the Philippines, found the evening talks “so beneficial” and the Aldersgate Service “so rich in heritage” that she was overwhelmed with joy. “I would like to attend next year’s convention and I pray that our faculty and staff members will be able to come too,” said Ms Nabor, who is the Registrar of the IEMELIF Bible College in Quezon City, Metro Manila. Her colleague, Mrs Dorcas Grace S. P. Bringula, said: “This is the first time that we have heard of the Aldersgate Convention, and I am happy that we could come because it was a good way of sharing the Good News of Jesus Christ. Loo Quanxiang, 16, from the Methodist Church of the Incarnation, said: “What captured my interest most about the talks given by the Rev Dr David Wilkinson on the Saturday seminar was his scientific approach to Christianity. Living in a modern world, I have often doubted the credibility of what we Christians were learning and believing in. However, Dr Wilkinson reminds us that God created everything, including science, which means that science would never disprove the existence of God. The first evening talk at ACS (Independent) on May 21 attracted 1,150 people, including 350 students from the school. The Rev Dr Wilkinson spoke on the topic “God, the Big Bang and Stephen Hawking” (see story on Pages 6 & 7). The following evening, 510 turned up to listen to his address entitled “Are we alone in the Universe: Search for Extra-terrestrial Intelligence and God”. The final talk was entitled “Left Behind, Frozen or Fried? Hope in the face of the future of the Universe”, which drew 480 people. The Aldersgate Service on May 24 saw a dip in attendance – some 600 people turned up. Delivering his sermon entitled “The Supremacy of Jesus”, the Rev Dr Wilkinson stressed that Jesus is supreme in revelation, in creation and in reconciliation (see story on Pages 6 & 7). 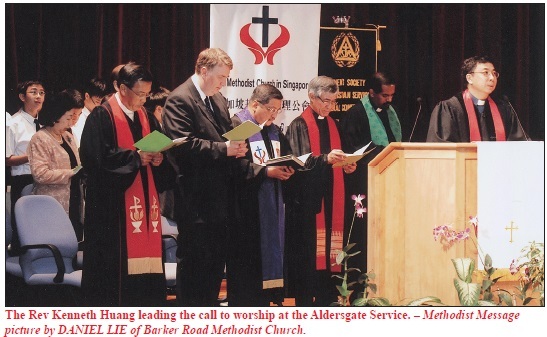 The service began with the singing of the processional hymns and choruses immediately after the call to worship led by the Rev Kenneth Huang, Pastorin- Charge of Living Waters Methodist Church. The procession, led by the Processional Marshall, Pastor Edmund Koh of Living Waters Methodist Church, was a colourful sight as carriers of the Cross, Bible, Banners and pastors from the three Annual Conferences, resplendent in their robes, trooped into the hall. Bringing up the rear flank were Mrs Laureen Ong, President of the General Conference Women’s Society of Christian Service; the Rev Khoo Cheng Hoot, President of the Chinese Annual Conference; the Rev James Nagulan, President of Emmanuel Tamil Annual Conference; the Rev Wee Boon Hup, President of Trinity Annual Conference; the Rev Dr Wilkinson and Bishop Dr Robert Solomon. Music was provided by the Anglo- Chinese School (Independent) Choir, directed by Mrs Elaine Wan, the Paya Lebar Methodist Girls’ School (Primary) Angklung Ensemble and Bamboo Praise, and the Methodist Combined Orchestra/Wesley Ensemble and Friends, under the baton of Mr Jusuf Kam. Towards the end of the service, four pastors, all from Trinity Annual Conference, were called to receive their 25-year Long Service Award from Bishop Dr Solomon. The Rev Dr Daniel Koh Kah Soon, the Rev Paul Nga Hook Sing and the Rev Sng Chong Hui received a Bible each. 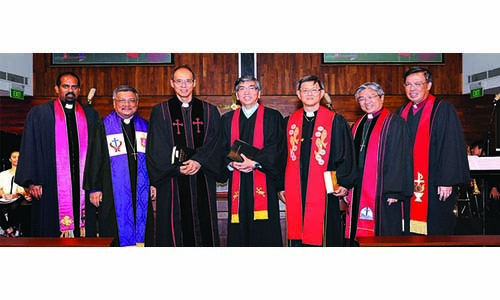 The Rev Tan Cheok Kian was not present as he was in China on a mission trip.